Deforestation in the Brazilian Amazon has continued to rise compared to a year ago, when forest loss had already reached decade-high levels. Since coming to power, President Jair Bolsonaro has taken controversial steps to undermine environmental and indigenous protections, an approach that has been compared to that of Brazil’s military dictatorship. Current efforts to legalise agribusiness activity on indigenous lands promise to unleash hard battles for the preservation of the Amazon. Data published by Imazon, a Brazilian conservation NGO, reveals a 54 percent increase in deforestation in the Amazon in January 2019 compared to the same month last year. Forest loss totalled 108 square kilometres, the equivalent to around 490 football fields per day. Deforestation in the Brazilian Amazon has been higher every month since August 2018 compared to the same month the year before, except for October. In December, 246 square kilometres were deforested, a 34 percent increase compared to December 2017. In November, deforestation reached 287 square kilometres, a 406 percent increase compared to November 2017. More than two thirds of the deforestation registered from November to January took place in the states of Pará and Mato Grosso, part of the Amazon ‘arc of deforestation’ that has suffered heavy forest loss in recent decades to cattle ranching, grain crops – especially soy – logging, mining and infrastructure projects. These increases follow the highest levels of Amazon deforestation in a decade recorded between August 2017 and July 2018, when 7,900 square kilometres of native forest were lost mostly to illegal logging and agricultural expansion. Greenpeace laid the blame for these decade-high levels of Amazon forest loss on the federal government and the agribusiness lobby in congress for adopting measures to undermine protected areas, starve enforcement agencies of resources and give amnesty to illegal deforesters. 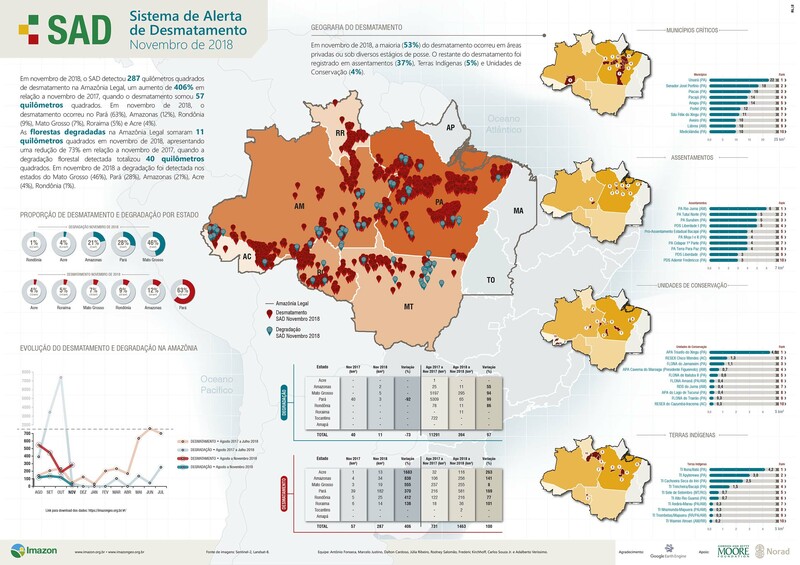 Part of the deforestation registered between November 2018 and January 2019 took place at protected areas, including indigenous reservations, such as Ituna/Itatá, Cachoeira Seca do Iriri and Apyterewa in Pará, and Xingu in Mato Grosso. Together these reservations lost nearly 27 square kilometres. Other protected areas in Rondonia, Amazonas, Pará and Acre have also lost several thousand hectares of forests. Deforestation at the Awá Indigenous Reservation in the state of Maranhao. Image courtesy of Mário Vilela/FUNAI. Brazilian President Jair Bolsonaro came to power in January after promising the agribusiness lobby to “get the State off the necks of producers” by scaling back environmental protections and law enforcement, and halting indigenous land demarcations. His rhetoric during and after the 2018 presidential elections has been largely hostile to the protections enjoyed by indigenous peoples and quilombolas – communities of descendants of runaway slaves – under Brazil’s Constitution and federal law. Invasions of indigenous lands by land grabbers, loggers, farmers and cattle ranchers have allegedly skyrocketed since Bolsonaro won the elections. 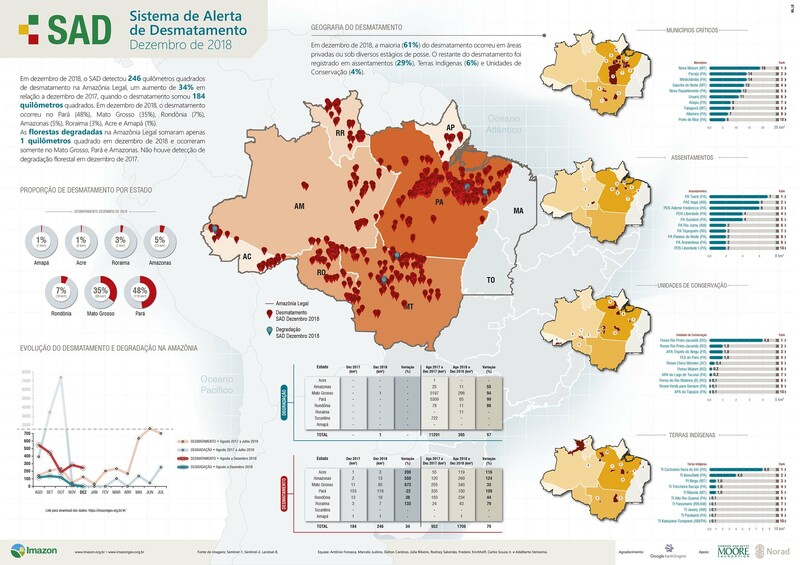 At least 14 indigenous reservations in the states of Rondonia, Pará, Maranhao, Mato Grosso do Sul, Pernambuco and Espírito Santo were reportedly under attack during the first two months of 2019. FUNAI staff and indigenous leaders have claimed that the current political climate has led to a “free for all” scramble for land. Joênia de Carvalho of the Wapishana tribe, the first indigenous woman elected to the Brazilian congress, has told The Guardian that Bolsonaro’s rhetoric has had a negative impact. “People who covet indigenous lands and have a certain dispute with indigenous lands start to believe this and start to initiate conflicts,” she said. To be sure, Bolsonaro’s stated intentions do not mark a sharp break with recent governmental policy. The power of the agribusiness lobby in congress – known as the Parliamentary Agricultural Front (FPA) and which has long opposed what it sees as excessive environmental protections and demarcation of indigenous reservations – has been on the rise for several years. Michel Temer, the previous president, allied himself with the FPA to adopt a number of measures that weakened the status of protected areas, starved environmental enforcement agencies of funds, and granted amnesties to illegal deforesters. Even before that, in 2012 – the year when deforestation in the Amazon started regaining momentum after years of decline – congress, led by the agricultural lobby, approved a new, weaker Forest Code that reduced the required level of forest reserves in private properties in the biome from 80 to 50 percent provided that the state where the property is located has set aside at least 65 percent of its territory for protected areas. A study recently published in Nature Sustainability has found that these changes could result in a net decrease in protected areas throughout the Brazilian Amazon, endangering between 6.5 and 15.4 million hectares. The new Forest Code also granted amnesty for illegal deforestation carried out before July 2008. Early last year, Brazil’s Supreme Court ruled this measure to be constitutional, a decision that dismayed conservationists. Despite several years of setbacks, the Bolsonaro presidency threatens to herald new lows for environmental protection in Brazil since the return to democracy in the 1980s. The new government has shown a willingness to adopt measures that previous governments had avoided. Bolsonaro’s first act as president was to sign Provisional Measure (MP) 870/2019, granting the Ministry of Agriculture the power to demarcate new indigenous reservations, a mandate previously belonging to FUNAI – the indigenous affairs agency – and the Ministry of Justice. He also gave the Ministry of Agriculture, now headed by former FPA leader Tereza Cristina, the responsibility for environmental licensing for projects within indigenous and quilombola lands. Members of the Karipuna community at the Karipuna indigenous land in the state of Rondonia. Image courtesy of Rogério Assis/Greenpeace. FUNAI has been moved from the Ministry of Justice to the newly-created Ministry of Women, Family and Human Rights Issues. These decisions have been interpreted as an attempt to dismantle FUNAI. According to Instituto Socioambiental, a conservation NGO, the measures have “emptied and shredded” the agency, which for decades has held the responsibility to protect indigenous rights and the integrity of their lands. With Tereza Cristina, a prominent member of the agribusiness lobby, at the head of the Ministry of Agriculture and in charge of land demarcations, indigenous communities are bracing for even harder times ahead. A recent report by the Indigenous Missionary Council (Cimi), part of the Catholic Church, includes Cristina in a list of 50 parliamentarians with a clear anti-indigenous rights record. Unsatisfied with this initial overhaul of indigenous policy, the federal government wants to go further. Bolsonaro, Cristina and the FPA are pushing to legalise large-scale agriculture in indigenous reservations, currently banned by the Constitution. Bolsonaro is expected to issue a presidential decree to permit agribusinesses to lease land within indigenous reservations, bypassing debate in congress and with affected communities. In February the First National Meeting of Indigenous Farmers took place, attended by Tereza Cristina and Environment Minister Ricardo Salles. Salles, an atypical environment minister handpicked by Bolsonaro, and Cristina have promoted the idea that indigenous communities should be able to cultivate genetically modified soy (federal law prohibits the planting of genetically modified organisms within indigenous reservations). Salles and Cristina are seeking changes to legislation that would allow indigenous people to lease their lands to agribusinesses for the production of industrial-scale commodity crops. This would make an existing problem worse. According to FUNAI, 22 indigenous reservations have already lost 3.1 million hectares of forests to illegal grain and cattle production. Indigenous leaders are not amused. “Indigenous peoples reject the model of [agribusiness commodities] monoculture, which is not compatible with our reality and our way of life,” Dinaman Tuxá, coordinator of the Articulation of the Indigenous Peoples of Brazil (APIB), told Mongabay. The Ministry of Agriculture has attempted to legitimise its proposals by claiming that Ibama – Brazil’s environmental enforcement agency – and the Federal Prosecutor’s Office set a precedent when they authorised large-scale soy, corn and bean production on 18,000 hectares of the Utiariti indigenous reservation in Mato Grosso. Both Ibama and a federal prosecutor in Mato Grosso have strongly denied they ever issued such authorisation or that it is even within their mandates to do so (Ibama has in fact sanctioned the indigenous community for allowing large-scale farmers, also fined, to exploit their lands, which are protected areas and belong to the Union). Bolsonaro’s government and the FPA are clearly not without opposition. Immediately after MP870 was signed, the Attorney General’s Office and the Federal Prosecutor’s Office said they would likely take legal action against the measure if they found it represented a setback to established rights. In late February four federal public prosecutors published a scathing attack on Bolsonaro’s measures, which were adopted without consultation with indigenous peoples, FUNAI or the Ministry of Justice, claiming they violated the Constitution and the International Labour Organisation’s Convention 169, and were reminiscent of practices last seen during Brazil’s military dictatorship. In early March, Deputy Attorney General Antônio Bigonha issued a statement arguing that the Provisional Measure was unconstitutional. Bigonha said the 1988 Constitution clearly separated indigenous policy from agribusiness interests, a principle that the MP violated. Federal Public Prosecutor Marco Antônio Delfino has gone further to say that Bolsonaro’s policies embody a colonial mentality that seeks to integrate indigenous peoples with “civilised” society as “slave labour” for Brazil’s ambitious agricultural expansionism. The stage is set for difficult battles ahead, pitting conservationists and indigenous peoples on one hand and agribusiness interests on the other. With less than three months in office, Bolsonaro has already started to fulfil his pledge to take a hammer to indigenous and environmental policies. The question remains as to whether his administration will consolidate its early gains or be plagued by legal challenges and widespread opposition. Image on homepage shows recent deforestation spots in the Brazilian Amazon. Courtesy of Imazon.